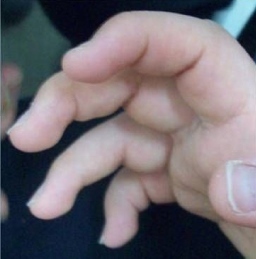 Pitt Hopkins Syndrome (PTHS) is a genetic condition that causes severe developmental problems. It has been classified as a member of the pervasive development disorders (1). People with these disorders have problems with socialization and communication skills. PTHS is also classified as an encephalopathy, or a condition that affects brain function (2). Although PTHS is a severe condition, it is not progressive, which means that it doesn't get worse with time. PTHS is a very rare disease, with only ~200 patients reported as of 2015 (2), and only a handful since then. However, some researchers believe that the true number of PTHS patients may be higher because of under-diagnosis. It appears to affect people in all racial and ethnic groups (see Cause, below). A large majority of infants with PTHS are of normal size at birth (in our literature survey, birthweight was normal in 85% of ~100 infants for whom information was provided). Pregnancy is also typically normal. The first signs of disease tend to show in	infancy as developmental delay/failure to meet milestones. For example, infants may not be able to hold their heads up or sit up when expected; this delay is due to low muscle tone (floppiness). In addition, most people with PTHS don't learn to speak, though a few learn less than 10 words, and a very few can speak in sentences (3). Some patients also don't learn to walk, with those that do learning late to very late (i.e., at ages 2 to 4 or later). Most patients have a happy personality, but they may also become anxious or agitated. The most common signs and symptoms of PTHS are listed below. A hallmark feature of PTHS is a breathing abnormality where a patient hyperventilates and then holds his or her breath until turning blue. These episodes may happen very frequently, with reports of them occuring up to 8 times per hour or even 90 times per day (3, 4). People with PTHS also have a similar facial appearance; the traits listed below reportedly occur in 95% or more of patients (2). The boy pictured at the top of the page has a typical PTHS appearance. There is no single treatment for PTHS. A recent review noted that because of differences between patients, a management strategy should be created for each individual patient (1). Given the variety of problems that occur in patients, it is likely a good idea to consult a range of specialists in addition to a pediatrician or family physician. These include neurologists, gastroenterologists, physical, occupational, and speech therapists, and others as deemed necessary. Seizures can be controlled with standard anticonvulsants (1, 2, 5). Breathing abnormalities are harder to control, yet affect quality of life for both patients and caregivers. One study reported that sodium valproate reduced the frequency of abnormal breathing spells in a 7-year-old girl (6). However, it didn't appear to improve breathing problems in another patient (a young adult male), although acetazolamide did (7). The same study reported that acetazolamide stopped these problems in a 9-year-old boy (7). Finally, a 15-year-old boy who had up to 8 breathing attacks per hour was also given acetazolamide, and the number of attacks he had was reduced by 70% (4). Another study reported that anti-seizure medication had no effect on hyperventilation-breathholding episodes, but did not name the medication(s) used (8). PTHS is an autosomal dominant disorder caused by mutations in the gene TCF4 (9, 10). The term autosomal dominant means that the disorder occurs when one copy of a mutated gene is present. Autosomal dominant disorders are often passed from one parent to a child. However, PTHS is different. Because the disease is so severe, no patient has been reported to have had a child and the disease is only passed from a parent to a child when a condition called mosaicism is present. In these cases, one of the parents has a mixture of cells with and without TCF4 mutations. The parent is not affected with PTHS, but can pass it to the child. Apart from these rare cases, mutations usually occur sporadically --- meaning that they happened for unknown reasons in the egg or the sperm. This is why PTHS is expected to affect members of all racial and ethnic groups. The link at the right provides information about labs that test for mutations in TCF4. The protein made by TCF4 is found in the brain, muscles, lungs, and heart. It is a transcription factor, meaning that it helps control activity of other genes. Specifically, it has roles in helping cells mature so that they can perform specific functions. It also has role in programmed cell death, which is when cells self-destruct (such as, for example, if something goes wrong inside them and they need to be destroyed). When maturation and self-destruction do not occur as they are supposed to, health problems like those seen in PTHS develop. Two sets of diagnostic criteria for PTHS have been published (2, 11). Both assign points to different features of the syndrome. A patient is examined and points s/he gets are summed. The score is used as guide to the need for testing for mutations in TCF4>. Diagnostic scoring for PTHS (Whalen, 2012; ref. 11). Points for each trait are in parentheses. Negative points (bottom) are associated with diseases related to PTHS. Highest possible score: 20. According to the people who created this scale, a score above 15/20 is a good indication that the patient will have mutations in TCF4. However, PTHS patients who are under age 3 may not have developed all signs of PTHS. In this group, a score between 10 and 15 indicates that TCF4 testing may be a good idea. In older patients who score 10-15, testing for PTHS should be considered carefully, with understanding that the patient could have Angelman syndrome, Rett syndrome, or Mowat-Wilson syndrome instead. According to the study authors, scores under 10 are not indications for TCF4 testing. For more detail on how this diagnostic system was tested, see reference 11. Diagnostic scoring for PTHS (Marangi, 2015; ref. 2). Points for each trait are in parentheses. This system does not use negative points. Highest possible score: 16. A score of 13 or higher is highly suggestive of a mutation in TCF4, indicating high probability that the patient has PTHS. Angelman syndrome (AS). AS is very closely similar to PTHS. People with both syndromes don't develop spoken language skills, have severe intellectual disability, and a happy personality. They may also have seizures, an ataxic gait, and microcephaly/a small head. One difference between PTHS and AS is that people with AS do not seem to have the facial features seen in PTHS, especially the features of the mouth and nose (2, 12). These features can help distinguish the two syndromes, but genetic testing is the only way to be completely certain of the diagnosis. AS is caused by abnormalities in the gene UBE3A. A recent study found that 2% of people diagnosed with AS actually had PTHS. Rett syndrome (RS). RS is another neurodevelopmental disorder with signs that are very similar to PTHS. Patients with both disorders do not have language skills and show repetitive hand movements. One key point about RS is that patients are almost always girls. Most boys with RS die before birth or in infancy; a very few survive until adulthood. Thus, being male does not rule RS out, but it is a strong indication that the patient does not have RS. A key difference between RS and PTHS is loss of purposeful hand use in RS. This term means that children with RS lose the ability to use their hands for purposeful tasks, such as playing with toys, pointing, reaching for objects and holding them, self-feeding, etc. People with PTHS may have impairments in hand use, but unlike RS patients, they know how to use their hands. In addition, RS patients typically acquire motor and language skills in very early life. The disease takes these skills away. PTHS patients never gain some skills, but do not lose them in the way that RS patients do. RS is caused by mutations in the gene MECP2, and sequencing can distinguish between it and PTHS. Mowat-Wilson syndrome (RS). Like AS and RS, MWS looks very similar to PTHS. MWS patients have severe intellectual disabilities, seizures, and facial features that resemble PTHS. However, heart defects and a condition called Hirschprung disease occur in roughly half of MWS patients. Hirschprung disease affects areas of the large intestine. These areas lack nerve cells, which creates problems passing stool. HD and heart defects are rare in PTHS. If present, they are are clues that can help distinguish the two disorders. MWS is caused by mutations in the gene ZEB2, and sequencing can distinguish between it and PTHS. 1. 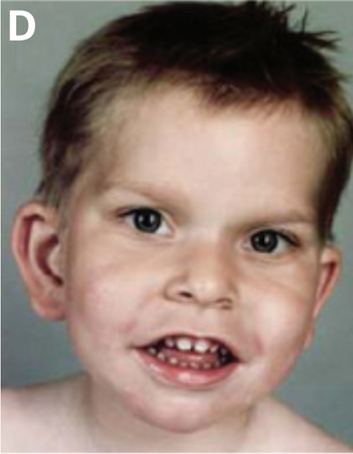 Sweatt JD (2013) Pitt-Hopkins syndrome: intellectual disability due to loss of TCF4-regulated gene transcription. Exp Mol Med 45(5) e21. doi: 10.1038/emm.2013.32. Full text on PubMed. 2. Marangi G & Zollino M (2015) Pitt-Hopkins syndrome and differential diagnosis: a molecular and clinical challenge. J Pediatr Genet 4(3):168-176. Full text on PubMed. 3. Steinbusch CV et al. (2013) Somatic mosaicism in a mother of two children with Pitt-Hopkins syndrome. Clin Genet 83(1):73-77. Abstract on PubMed. 4. Gaffney C & McNally P (2015) Successful use of acetazolamide for central apnea in a child with Pitt-Hopkins syndrome. Am J Med Genet A 167(6):1423. Abstract on PubMed. 5. Peippo M & Ignatius J (2012) Pitt-Hopkins Syndrome. Mol Syndromol 2(3-5):171-180. Full text on PubMed. 6. Maini I et al. (2012) Clinical and polygraphic improvement of breathing abnormalities after valproate in a case of Pitt-Hopkins syndrome. J Child Neurol 27(12):1585-1588. Abstract on PubMed. 7. Verhulst SL et al. (2012) Acetazolamide for severe apnea in Pitt-Hopkins syndrome. Am J Med Genet A 158A(4):932-934. Abstract on PubMed. 8. Peippo MM et al. 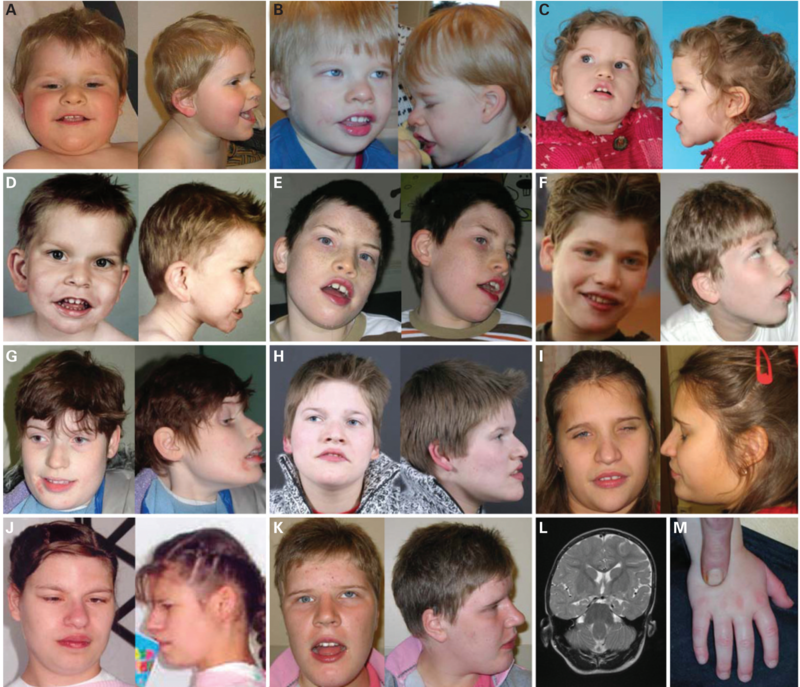 (2006) Pitt-Hopkins syndrome in two patients and further definition of the phenotype. Clin Dysmorphol 415(2):47-54. Abstract on PubMed. 9. Amiel J	et al. (2007) Mutations in TCF4, encoding a class I basic helix-loop-helix transcription factor, are responsible for Pitt-Hopkins syndrome, a severe epileptic encephalopathy associated with autonomic dysfunction. Am J Hum Genet 80(5):988-993. Full text on PubMed. 10. Zweier C et al. (2007) Haploinsufficiency of TCF4 causes syndromal mental retardation with intermittent hyperventilation (Pitt-Hopkins syndrome). Am J Hum Genet 80(5):99-1001. Full text on PubMed. 11. Whalen S et al. (2012) Novel comprehensive diagnostic strategy in Pitt-Hopkins syndrome: clinical score and further delineation of the TCF4 mutational spectrum. Hum Mutat 33(1):64-72. Abstract on PubMed. 12. Takano K et al. (2010) Two percent of patients suspected of having Angelman syndrome have TCF4 mutations. Clin Genet 78(3):282-288. Abstract on PubMed. 13. Zweier C et al. (2008) Further delineation of Pitt-Hopkins syndrome: phenotypic and genotypic description of 16 novel patients. J Med Genet 45(11):738-744. Abstract on PubMed. 14. 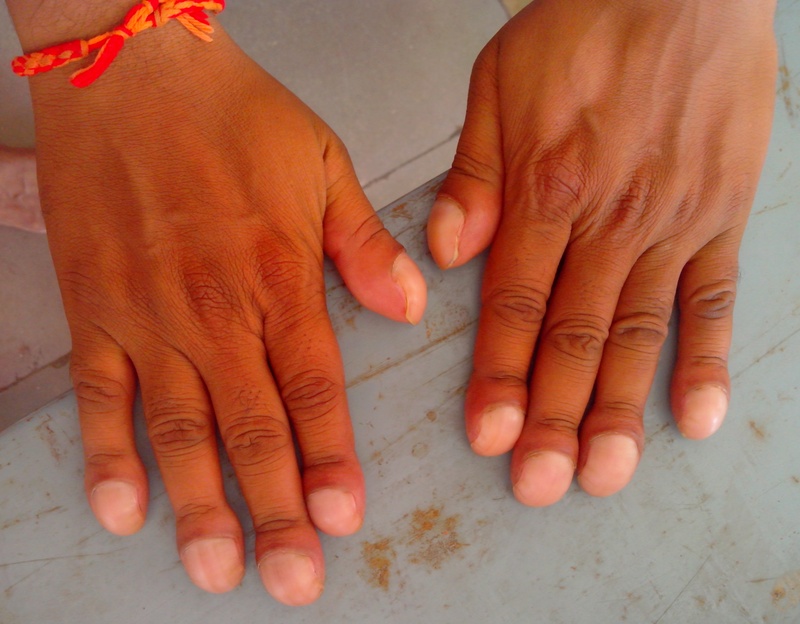 Sidsandyy (2015) Clubbing [o]f fingers noted of a patient during routine dental checkup. Photo on Wikimedia Commons. 15. Ko JM et al. (2010) Phenotypic and cytogenetic delineation of six Korean children with Kabuki syndrome. J Genet Med 7(1):37-44. Full text. 16. GoioWiki (2007). Pé de uma mulher portadora de sindactilia (Foot of a woman with syndactyly). Photo on Wikimedia Commons. Above: A woman with 2-3 toe syndacytly (the second and third toes are fused or partially fused). Source: reference 16.